In Repeatability, Chris Zook and James Allen—leaders of Bain & Company’s influential Strategy practice—warn that complexity is a silent killer of profitable growth. 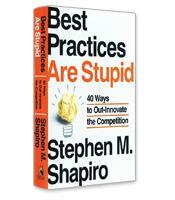 Successful companies endure by maintaining simplicity at their core. They don’t stray from, or regularly discard, their business model in pursuit of radical renovation. Instead, they build a “repeatable business model” that produces continuous improvement and allows them to rapidly adapt to change without succumbing to complexity. In 2001's Profit from the Core, Chris Zook, the head of Bain's Strategy practice, and independent consultant James Allen urged companies to stick to one or two well-defined dominant core businesses. Zook's follow-up book, Beyond the Core, showed how these core businesses could be leveraged for growth, while his third book, Unstoppable, focused on renewing the core through hidden assets. 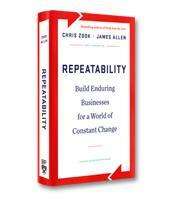 Repeatability, a new collaboration between Zook and Allen, is a how-to manual on creating the business model that will achieve the "focus-expand-redefine" core-based strategies described in the three previous books. 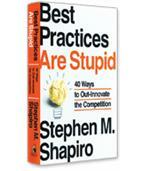 As reflected in the title, core-based strategies depend on a "repeatable business model" that allows the company to adapt quickly to change without succumbing to what the authors call, "the silent killer of growth strategies": complexity. That complexity, according to the authors, comes in many forms, from "complexity of organizations layered with constant new initiatives and systems" and "complexity of messages throughout the organization" to the "complexity of implementation across different markets." A repeatable business model, write the authors, cuts through the complexity because it focuses on a few core principles or imperatives. Nike, for example, has a business model that is built on "four core interlocking capabilities": 1) brand management, 2) athlete partnerships, 3) award-winning design and use of new materials, and 4) an efficient supply chain to Asia. In 1989, the authors note, Nike and chief rival Reebok were comparable in size, profitability and brand recognition. Since then, however, Reebok has been bouncing around from one "idée du jour" to another, while Nike used its core capabilities to redefine and dominate its industry. Vanguard, Tetra Pak and Apple are some of the other companies cited by the authors that have created a repeatable business model that allows them to adapt to change and improve continuously without succumbing to complexity or inconsistency. Using the rich research resources of Bain, including a multi-year study of 200 companies and a survey of 377 executives, the authors identified three "design principles" that are at the heart of all "Great Repeatable Models." The first principle is a strong, well-differentiated core. Companies with Great Repeatable Models, write the authors, have "unique assets, deep competencies and capabilities" translated into behaviors and product features that fundamentally differentiate the company from its competitors. These core activities not only produce differential profits, but also drive learning, change and improvement. The second principle is what the authors summarize as clear nonnegotiables, which refer to the behaviors and mindset required by the strategy. The issue here is one of alignment. Management and employees must have the same understanding and commitment to the organization's strategy. Clear nonnegotiables reduce the "distance" between senior management and the front lines. The third principle is well-developed systems for closed-loop learning. Rigorous feedback is essential for continuous learning and the ability to adapt to change, according to the authors. Great Repeatable Models have the systems that allow management to stay in constant contact and communication with customers and front-line employees. These same feedback and learning systems are essential when, as described in Clayton Christenen's The Innovator's Dilemma, the industry is transformed by a new technology and product. In the three major chapters of the book, Zook and Allen, now a fellow Bain partner and co-director of the firm’s Strategy practice, illustrate in detail these three core principles. Another chapter deals with the important leadership issues tied to the three principles — the importance of defining a broad strategy and grand vision versus a narrow strategy, for example. As a book, Repeatability, in essence, reflects the attributes of the business models it advocates: The authors, using clear language, selected charts and numerous in-depth case studies, cut through the complexity of management and strategy to reveal a deep and adaptable core methodology for business success.